I have created the Menu from Hero template, moved the top bar to bottom and have a submenu under services which seems to get hidden underneath the other bar. Website is www.dainamik.com.au and the issue occurs when you hover over Services menu. There is two other entries which don't show beacuse they are "behind"
I have the exact same issue, I would also like to know how I can fix this. I have followed your suggestion however no change. Try to remove previous suggested CSS. Then inspect the Bar where the menu is added. Make sure that Content Scrolling is set to OFF. Awesome, that did it !! Had to also make sure Z-index was higher number than other bars. 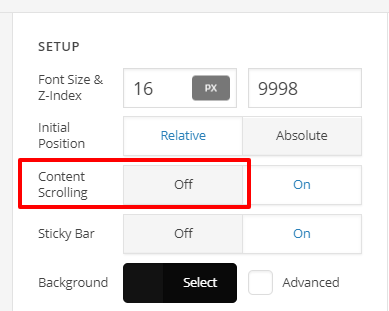 Could you tell me where I can find info on all the settings, like Content Scrolling and what they do. Some are straight forward but others are harder to understand. For guidance, please check our knowledge base.